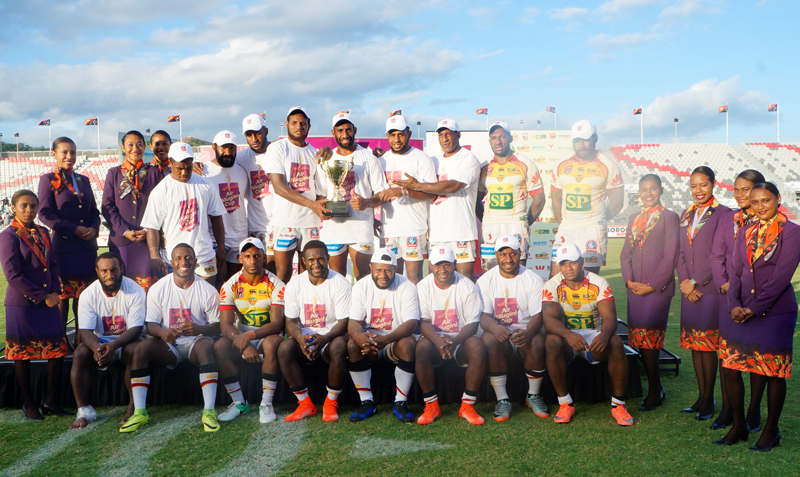 The inaugural Air Niugini Kokoda Cup was launched in a colorful ceremony on Sunday at the National Football Stadium in Port Moresby, coinciding with the Queensland Intrust Cup round 12 match between SP PNG Hunters and Townsville Blackhawks. Six Air Niugini cabin crew in full uniform carried the cup out onto the field and handed it over to the captains of SP PNG Hunters and Blackhawks to mark the launch of Air Niugini Kokoda cup. They were accompanied by the airline and PNGRFL officials. Air Niugini Acting Chief Executive Officer, Mr Marco McConnell said the inaugural Air Niugini Kokoda Cup recognizes the airline’s recently launched Port Moresby to Townsville direct service. It also commemorates the 75th anniversary of Kokoda, an important event in the history of PNG and Australia. He said the event will be held annually where Air Niugini will give a different name to the cup each year to commemorate important events in Papua New Guinea. Air Niugini’s General Manager, Mr Dominic Kaumu said this cup further strengthens the sister city relationship between Port Moresby and Townsville. It also promotes sports tourism between the two cities. He encouraged Papua New Guineans living in and around Townsville, supporters of the Blackhawks as well the business and corporate community to make use of the event. “ Those in Port Moresby can also fly to Townsville to watch SP PNG Hunters play, visit families and friends, do business and return. And those in Townsville can come up here to do business and watch the game in our newest sports facilities”. Kaumu said. Air Niugini operates two direct services from Port Moresby to Townsville in a week, every Monday and Friday. PNGRFL CEO Reatau Rau thanked Air Niugini for its continuous support towards the SP PNG Hunters as well as rugby league throughout the country with discounted airfares for their travel. Sunday’s Air Niugini Kokoda Cup launch commenced with a curtain raiser between Hela Wigmen and Rabaul Agmark Gurias., followed by SP PNG Hunters and Townsville Hawks in the Queensland round 12 Cup match. Hunters thrashed Blackhawls 42- 4.